Some historical films tell you more about the era in which they were made than ones actually set in that period. 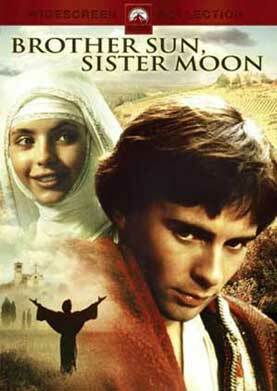 Franco Zeffirelli’s Brother Sun, Sister Moon is a case in point. A dramatic recreation of the life of Francis of Assisi, the story takes place in 13th century Italy. However, with a soundtrack composed and performed by the British folk singer Donovan, the film plays more like a hippy nature trip with the fresh faced Francesco (Graham Faulkner) frolicking through meadows bursting with red poppies like an innocent fawn gambolling in the sun. It’s all a bit hilarious really. Especially when you realise that this was one of the most popular films, screened on high rotation in halls around Nimbin and Mullumbimby back in the early ’70s. Newly returned to Assisi from fighting in the Crusades (that old holy war against the Muslims), Francesco is besieged by disturbing memories of the battlefield. His aristocratic mother (Valentina Cortese) soothes him with lullabies until he finally awakens from his nightmare and starts chasing sparrows in his night gown up on the rooftop. One day, while contemplating butterflies, Francesco starts up a relationship with the angelic Clare (Judi Bowker), another child of noble blood who secretly feeds the lepers hiding out in the woods. The rest of the town might think he’s raving mad but she understands his spiritual inclinations. And so Francesco throws caution, not to mention all his merchant father’s fine cloths and his own clothes to the wind and sets off to start a new life without possessions. But when the church in which he and his followers worship is burned down and one of his men is slain by the Bishop’s soldiers, Francesco heads off to Rome to find out where he went wrong. He is granted a life affirming audience with Pope Innocent 111 (Alec Guinnes) and it is in this lavish scene, shot in a Byzantine cathedral in Sicily, that the production design really peaks. The costumes, which until this point have been the most impressive thing about the film, also go into overdrive with church goers decked out in a rainbow of jewel encrusted robes. You can almost smell the incense permeating the mosaic walls but when all this opulence collides with the ragged, barefooted presence of Francesco and his posse, it suddenly rings hollow. Back out in the Umbrian hills is where the truth lies, at least for nature loving Donovan fans.